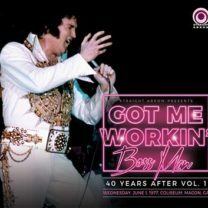 La Straight Arrow ha presentato l’ultimo di cd di prossima uscita intitolato “Got Me Workin’ Boss Man – 40 Years After Vol. 1” con il concerto inedito del primo giugno 1977 al Coliseum di Macon, in Georgia. Qualità audio amatoriale, ma molto buona visto che proviene dalla copia di prima generazione. 01. Introduction: Also Sprach Zarathustra – 02. C. C. Rider – 03. 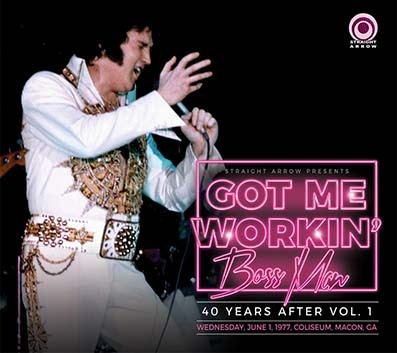 I Got A Woman / Amen – 04. Love Me – 05. Fairytale – 06. You Gave Me A Mountain – 07. Jailhouse Rock – 08. O Sole Mio (Sherrill Nielsen) / It’s Now Or Never – 09. My Way – 10. Little Sister – 11. (Let Me Be Your) Teddy Bear / Don’t Be Cruel – 12. And I Love You So (with break) – 13. Danny Boy (Sherrill Nielsen) – 14. Walk With Me (Sherrill Nielsen) – 15. Introductions of singers, musicians, orchestra – 16. Early Mornin’ Rain – 17. What’d I Say – 18. Johnny B. Goode – 19. Drum Solo (Ronnie Tutt) – 20. Bass Solo (Blues – Jerry Scheff) – 21. Piano Solo (Tony Brown) – 22. Electric Piano & Clavinet Solo (Bobby Ogdin) – 23. School Day – 24. My Heavenly Father Watches Over Me (Kathy Westmoreland) – 25. Hound Dog – 26. Big Boss Man – 27. Can’t Help Falling In Love -28. Closing Vamp.